"Dobbs uploaded a PDF file of one of his current invoice forms and created a mobile version, which meant no more poor handwriting." Sought a solution to eliminate the need for expensive paper-based invoice books, which were often filled with illegible handwriting. Implemented the GoFormz Mobile Forms Platform that made it easy to digitize their current invoice forms and ultimately replaced their pricey invoice books. Dobbs Heating and Air, INC. has provided their professional services in the Metro Atlanta area since 2008. Built on The Dobbs Difference, the company vows to be honest, dependable and reliable while providing the best HVAC products and services at reasonable market prices. It does not take long for you to notice how much they value their customers and teammates. 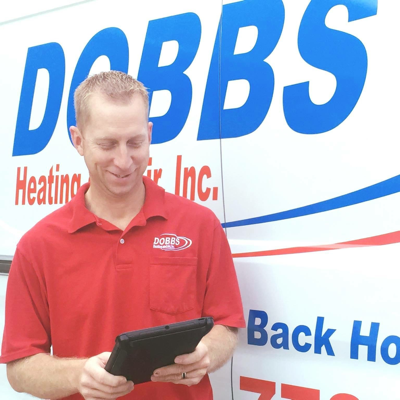 Before finding GoFormz in 2016, Dobbs Heating and Air was suffering from an inefficient invoicing process. To begin with, the invoice books the company used were an expensive, recurring cost. To make matters worse, technicians in the field were slowed down by having to fill out invoices by hand and often would write illegibly while trying to complete the forms quickly. When invoices finally made it to their office for processing, a large amount of time was wasted deciphering the tech’s handwriting. Owner, Keith Dobbs, knew this was an issue that needed to be resolved. After discovering and implementing GoFormz, Dobbs Heating and Air’s invoicing process was overhauled! Keith easily uploaded a PDF file of one of his current invoice forms and created a mobile version, which meant no more poor handwriting. Keith then equipped his field technicians with iPads so that they could access the invoice form from anywhere at any time. This allowed the techs to complete more forms in a faster, more accurate way. Today GoFormz continues to power many different form processes at Dobbs Heating and Air, like their timesheet and audit forms. Moving away from expensive paper form books to digital mobile forms has resulted in money and time savings for the Dobbs Team. Keith projects that he currently wins back about 10 hours a week using mobile forms. Although he has only used GoFormz for a short period, Keith is excited to see in what other ways it will bring positive change to his business.